Many of our patients at Vero Beach Art of Dentistry come to us for the first time, seeking regular general dental care, while others have sought us for our expertise in reconstructive and cosmetic dentistry. A few have even contacted us in severe discomfort. Some reach out for the first time because they would like to have their teeth cleaned. Whatever the reason, our trained experienced staff will help make your first appointment appropriate to your needs and desires. Dr. Johnson Hagood believes no two patients are alike. We take pride in learning how we can make a difference for each patient. We believe in taking the time to listen and understand your goals, your vision for your oral and overall health, and your expectations, timelines and life circumstances. This is because we realize that these factors affect your ability to choose and follow through with comprehensive dentistry. A new patient appointment typically begins with conversation. Every member of our team looks forward to meeting you and getting to know you. At your first appointment, you will experience a “preclinical” consultation before Dr. Hagood even looks at your mouth. This will be one-on-one time to talk about your concerns, health history, and what you want to achieve with his help. The length of the conversation depends on the goals of the new patient appointment you have scheduled, but flexibility is built into our schedule so each patient has the time they need. Once you are in the dental chair and being examined, the conversation will continue as Dr. Hagood gives you a tour of your mouth and explains what he observes. At Vero Beach Art of Dentistry, Dr. Hagood offers several types of new patient appointments. If you do not see the type you need or want on this list, don’t be concerned. Speak with our friendly receptionist about what you are seeking, and she will make the appropriate arrangement for you. On the first visit, we will discuss your goals and our beliefs and philosophy, as well as yours. We will then do a comprehensive oral exam, making the observations and necessary records of your mouth to determine your current oral health status. This typically takes two hours. On the second visit, we will review these records with you. Once you understand your current condition, we will discuss the changes you think you would like to make and help you develop a plan to get from where you are to where you want to be. We really enjoy this process and so do our patients. Read more details about Dr. Hagood’s comprehensive exams. Your first visit to our office may be for a dental cleaning, that includes a detailed periodontal health exam, cancer screening, and consultation with the hygienist and Dr. Hagood to review the results of the exam. This type of new patient appointment includes an initial consultation with Dr. Hagood, a limited oral examination, and a series of limited records, including digital photo images taken of your smile and teeth. Although this exam is not complete, Dr. Hagood is able to generally assess your oral condition, offer cosmetic and restorative suggestions, give a ballpark estimate of costs involved, and recommend the steps required before beginning treatment. This exam typically takes two hours. We understand how helpful it is to see how you will appear and feel with your beautiful new smile. 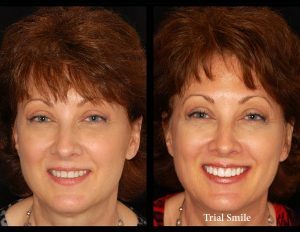 During this two-hour limited consultation, we can help you visualize future treatment results by performing a procedure called a “Trial Smile.” To prepare your trial smile, Dr. Hagood temporarily places cosmetic bonding material over your existing teeth, and expertly shapes the “new” teeth. This is done in a matter of minutes, and no numbing or tooth preparation is needed. One look at your trial smile will tell you what a thousand words could not explain. Photos of your smile before and after the trial smile helps you decide if you would like Dr. Hagood to proceed with a more thorough exam, impressions, and planning the details of your smile makeover. The photos also give Dr. Hagood a reference for your cosmetic treatment, allowing him to estimate the number of teeth and cost involved. Read more about The Trial Smile. Dr. Johnson Hagood is one of the nation’s experts in whole mouth rehabilitation, involving complex oral health issues, involving the restoration of teeth, replacement of missing or severely damaged teeth, realignment of teeth, elimination of periodontal disease, creation of a comfortable and healthy occlusion, elimination of pain related to TMD, and creation of an optimally esthetic smile. If you have multiple problems (or previously received treatment and been disappointed with the results) and want to discuss your problems, concerns and desires with Dr. Hagood, this type of appointment is a good one for you. This type of new patient appointment includes an initial consultation with Dr. Hagood, a limited oral examination, and a series of limited records. Although this exam is not complete, Dr. Hagood will be able to generally assess your oral condition, and give you his expert opinion on the types of treatment that would be involved in a customized treatment plan for your special mouth. The goals of the treatment plan will be to stabilize and improve oral health, function, and comfort, and according to a comprehensive plan, restore your special mouth in stages to the level of optimal health, function, and esthetics. He will be able to give you a ballpark estimate of costs involved, and recommend the steps required before beginning treatment. This exam typically takes two hours. If you would like Dr. Hagood to proceed with a thorough diagnostic workup for your custom whole mouth treatment plan, you will be scheduled for a second comprehensive examination appointment. Using articulated casts of your mouth and wax-up models of changes to be made, he can plan and orchestrate what many suffering patients refer to as a life-transforming “miracle.” If needed, he will involve the area’s finest dental specialists for certain procedures and work in close collaboration with them. The advantages and disadvantages of treatment options will be discussed with you and your preferences taken into consideration as he develops the plan he recommends for the most predictably successful and long-lasting results. During the development of your custom “whole mouth rehabilitation” plan, priority oral health needs can be addressed. For example, gum inflammation can be treated, painful tooth roots can be treated, temporary restorative and cosmetic bonding can be done, occlusal bite splint therapy can be utilized, and temporary prosthetics can be used to fill gaps in your smile. More expensive alignment of tooth roots, porcelain veneers, crowns, and implant-retained crowns or a multi-unit bridge can follow the initial health-stabilization and cosmetic treatments. Phased dentistry is a necessary aspect of complex whole mouth rehabilitation, but the process is rewarding as you go, and the results will astonish you. Any dental emergency, like an injury to the teeth or gums, can be potentially serious and should not be ignored. Ignoring a dental problem can increase the risk of permanent damage, as well as the need for more extensive and expensive treatment down the road. 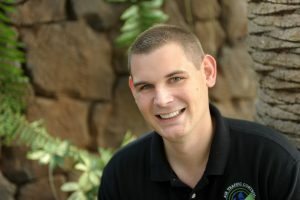 Dr. Hagood and his staff are highly trained in treating common emergencies, including toothaches, chipped or broken teeth, knocked-out teeth, extruded (partially dislodged) teeth, objects caught between teeth or under the gum, lost fillings, lost crowns, lost temporaries, broken orthodontic wires, abscesses, TMD/TMJ pain, swelling of the gum tissue or other soft tissue of the mouth, and soft tissue injuries to the lips, cheeks and gums. If you are experiencing a dental emergency, contact Vero Beach Art of Dentistry any day or time (24 hours a day, seven days a week). We will make arrangements to treat your dental emergency as soon as possible. This is an opportunity to visit our office, meet Dr. Hagood and our friendly team, and discuss your concerns with Dr. Hagood. After you meet Dr. Hagood to discuss your oral health history and problems, the concerns you may have, and the desires you have for your oral health, smile, and care, he will help you contemplate your dental future. You are under no obligation to schedule a second visit or accept examination and treatment. Appointments of this type are typically 15 to 20 minutes in duration.